Newsmax magazine's special section, "Reagan's 100: A Transformational President," pays tribute to "The Gipper," the former Hollywood star, union leader, and conservative reformer who went on to change America — and then changed the world. 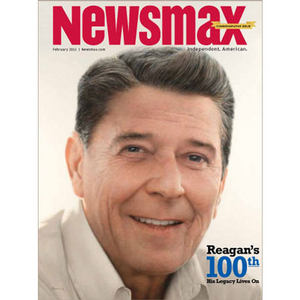 Newsmax's main feature story on President Reagan is written by presidential historian and best-selling author Douglas Brinkley, editor of "The Reagan Diaries." In this special tribute, Brinkley explores the secrets of Reagan's success and why he became one of the 20th century's most historic presidents. As America celebrates and remembers Ronald Reagan, Republicans again are ascendant on the political scene. Newsmax explores the meaning of Ronald Reagan today and how the nation can steer through a myriad of crises to become freer, stronger, and better. The Reagan coverage includes Newsmax CEO Christopher Ruddy's exclusive interview with former Soviet President Mikhail Gorbachev in Moscow. Gorbachev recalls his connection with Reagan as the "relationship that would change the world." Newsmax magazine readers also will have an exclusive Internet link to watch the historic video interview. Newsmax also includes reflections on Reagan and his place in history from major political figures, including Sarah Palin, Newt Gingrich, Mike Huckabee, and Haley Barbour. Reagan's elder son Michael takes our readers on an exclusive pictorial tour of the Reagan ranch near Santa Barbara, Calif., and a nostalgic photo spread depicts Reagan through the years, from a 1940s Life magazine ad to his 1981 inauguration. How Reagan became "The Great Communicator"
Newt Gingrich on "the greatest of Reagan's ideals"
Reagan's "best line of the Cold War"
Ben Stein: Reagan was never "just an actor"